90 Mk II - end of prod. Nowa wersja Mk II A otrzymała wzmocnione hamulce. 5493 Mk IIs were built. 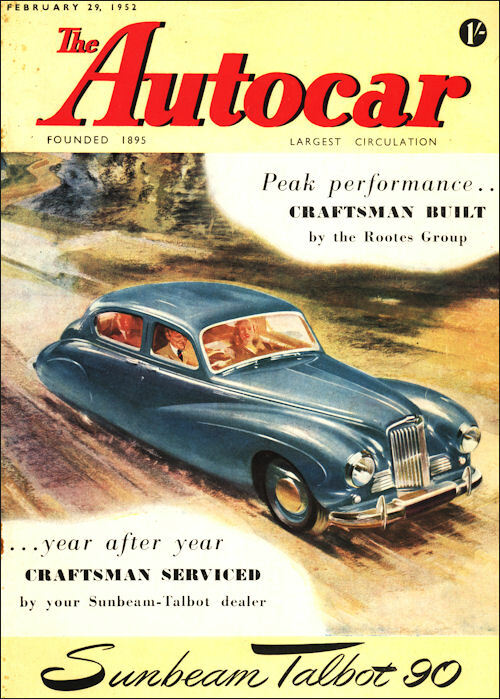 Mk II A of September 1952 have bigger brake drums, perforated wheels, no wheel spats, improved steering and suspension and more power, up to 77bhp at 4100rpm. 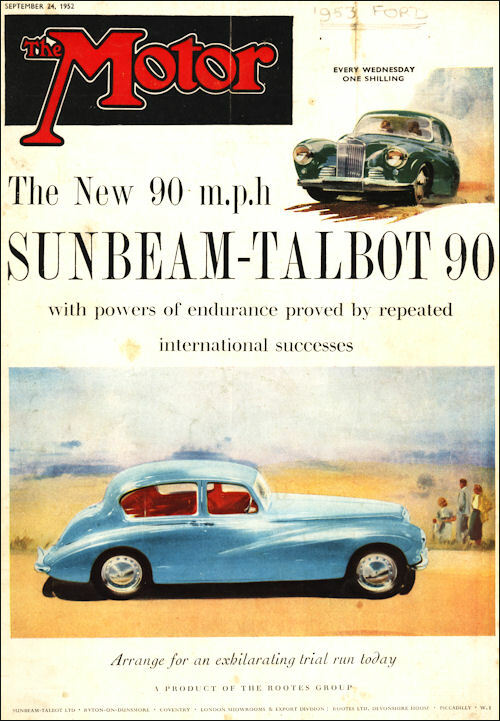 Prominent amongst a number of detail improvements in the Sunbeam-Talbot "90" for the coming season are bigger brakes with improved ventilation. In addition, minor modifications have been made to the front suspension and steering. The bodywork, whilst unchanged in general line, incorporates a number of new details for added comfort and convenience and external appearance has been altered by the fitting of new wheels and the omission of the wheel covers at the rear. To deal in detail with the most important change first, the increase in brake size is considerable, the linings now having a width of 2¼ in. as opposed to the previous 1¾ in., the drum diameter remaining at 10 in. as before. The change has increased the friction-lining area from 134 sq. In. to 172 sq. in. (an enlargement of over 28 per cent. ), and the brake lining area per ton (dry weight) is now 135 sq. in. In addition, moulded linings with improved anti-fade characteristics are used and the wheels are now of the ventilated disc type. Front-end improvements take the form of better oil seals on the upper and lower suspension wishbones (to give added protection to the threaded bushes and increase the intervals between maintenance) and the use of a plain bush in place of the existing screwed type for the bearing of the steering fulcrum; this permits of smaller clearances and gives a more positive response to the steering. The only remaining new feature of the chassis is the fitting of mud protection flaps which are now built into the inner surface of the front-wing valance panels to deflect mud and water, thrown up by the front wheels, from the gear-change mechanism and the pedal linkages. As an optional extra, an over-riding hand control can be provided for the automatic choke. This addition is offered mainly for the convenience of users such as doctors who have occasion to make frequent stops and starts with the engine neither cold or fully warm, a condition in which hand operation has advantages over a purely automatic arrangement. Two detail refinements concerning the doors are the fitting of "stay-open" checks, which prevent the door closing accidentally when it is fully opened and the fitting of new handles which offer a more comfortable grip and also appear more attractive. Internally, more head room has been provided in the front compartment by lowering the seats ¾ in., whilst one or two detail modifications have been made to the facia board and instruments, notably the adoption of edge lighting for the dials and the provision of a trip as well as a total mileage recorder in the speedometer. 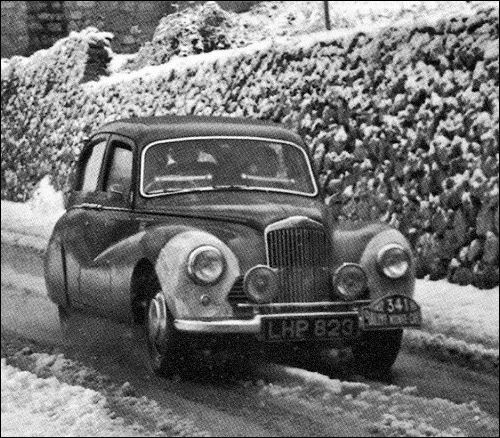 Stirling Moss drove this Sunbeam-Talbot 90 into second place in the 1952 Monte Carlo Rally.